A little over a month ago, on Thursday, April 9, 2015, you were diagnosed with autism. 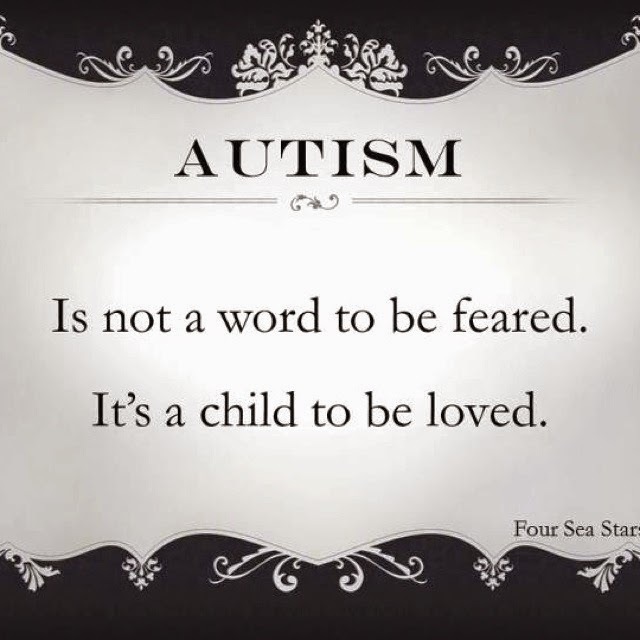 Even though we had had some suspicions for a while, to hear the doctor say "Mason has autism" and to see the ADOS report say "diagnosis : autism" struck me hard. We thought you aced the test with flying colors and we were going to be wrong. We just knew that the doctor was going to tell us that you were fine and it was all a big mistake. I knew I had overreacted. But I wasn't wrong. I was overwhelmed with all of the information that I was given. I didn't know where to go or where to start. Our world had just been rattled and I didn't know where to go from there. I thank my lucky stars that we have such a wonderful person in our life who could help us, who had been through the same thing. I talked to her on the phone for over an hour that night, picking her brain, asking her questions, hearing her story. She helped me in ways I can't even thank her enough for. I didn't cry. I was optimistic. We can do this. We told our family all we knew and could comprehend. I don't want this to be a secret. This is a part of you. You are a part of us. We will get through this together. People keep asking me and your dad if we are ok, and to be honest, I think we are. I know we are. You are no different today than you were on April 8. Nothing has changed except we were given more tools to help you thrive and grow. Then the other day I stumbled across this post and she said everything I was thinking. Reading that post made me cry. I couldn't believe that someone had put into words exactly what I was feeling and thinking. Your life today, as a newly diagnosed child with autism, will be very different than your life in a few years. Early intervention is key and I am so happy that we were able to get this diagnosis now, while you're two, rather than many years down the road. I see how well you respond to your speech classes and how much of a sponge your little brain is. I know this early diagnosis will only benefit you as you learn and grow in the coming years. And right now, there are still so many unknowns. We are still waiting to go to your follow up ENT appointment in June. Who knows, maybe he will still see fluid, you will get tubes, and your speech will take off. Maybe the fact that your hearing is muffled due to the fluid and minor hearing loss causes you to be so focused on one toy that you don't hear the sounds of other toys making noise in the background. Maybe once you can hear better, you will stop putting everything (non-food related) in your mouth and you can fully experience toys and writing utensils with all of your senses. I know this diagnosis is just one part of the puzzle. And there are so many that are still missing. In due time, we will see and learn more and as we learn more, the puzzle might change. This diagnosis does not define you. You are still the same sweet, loving, caring, amazing little boy that we've always known. You are friendly, you are outgoing, you are fearless. You are a joy to be around. And your dad and I... we will make sure we give you every tool you need to grow, learn, and thrive. I can't wait to enroll you in kindergarten and cry my eyes out that my little boy is growing up too fast. I can't wait to see you make your first science fair project. I can't wait to see you play sports. I can't wait to see you graduate high school and to help you move into a dorm at college and then really cry my eyes out that my little boy really is ALL grown up. And furthermore, I can't wait to meet the girl you know you are going to marry and then walk you down the aisle to wait for her. One day (long, LONG from now), you will make me a Grandma and make me the happiest I've ever been to hold a baby since July 18, 2012, the day you were born. I never thought of myself as a parent of a child with special needs. But here we are, here I am. A parent of a child with autism. And while that might be true and we might have some hurdles we need to jump over, you, your dad, and I are no different than we were on April 8. And I intend to treat you exactly the same way I did on that day from this day forward. I am constantly in awe and inspired by you. You make me want to be a better mama. I love you more with every day that passes. And it's 3:30 am and I'm sitting here crying. Not because of the diagnosis. But because of your strength. And because while I don't know mason I truly love that little boy. You can just tell from his big giant smiles that he's as sweet as they come. And I know this road isn't going to be easy- but you and Seth are just so wonderful that mason is one lucky little guy to have you. And for the record I got until "I intend to treat you the same way..." Until I lost it. Because I just love that. Mason hasn't changed. He's still the same sweet kid. And I hope the tests keep coming back and things just get clearer. Because mason kinda totally rocks and I just want the absolute best for him (and I haven't event met the boy! Which we need to change. I hear the aquarium is wonderful this time of year). I've been following you and Mason for month now and reading this just brings back so many memories and feelings when our Katie was born with spina bifida. Since our email conversations way back when you were still sorting the doctors/visitis, etc. out you have shown amazing courage. I understand the quiet pain that comes when no one is looking and you are so right my friend, Mason is the same as he was before you found out. As my neurosurgeon 25 years ago said to me, "take her home, feed her, clothe her in little girl dresses, hug, kiss, love and raise her no differently than you do the other two. Best advice ever! Remember, I'm email away if when those moment come (and they will come) when everything is just too much to handle and you need someone who has walked the road you are heading towards. I have taught childen in my class with A. and they are remarkable, and I mean remarkable students. Very touching and REAL post! Well that gave me a good cry this morning. So beautiful! Early intervention is key, and I'm so glad Mason will get the services from school that he needs and that you have a new understanding about him, though he indeed has not changed. You are wonderful to put it all out there. I am sure some moms aren't as brave. I pray your post will allow you some connections with other moms of kids with autism. Oh sweet momma, this is a beautiful letter! Mason is so lucky to have you and Seth for his parents! He is SO loved! And yay for early diagnosing! It will definitely make all the difference in the world for him! Autism used to be a scary word for me, mostly because I didn't understand it, until I married into a family where it seems to be very prominent in the men. Eric's little brother has it and so far, one nephew has officially been diagnosed (but Eric has multiple uncles who had it and they suspect that grandparents had it as well) Which means that we will be watching our little boy like a hawk for any signs as he grows so that we can get him in for a diagnosis if the needs ever arise. But the thing is, we ADORE my brother in law, he is the sweetest soul I've ever known. And a wonderful husband and daddy. And our love for my nephew never changed when he was officially diagnosed a couple years ago. It didn't change him or define who he was. It just answered a lot of questions we had about him. With all the love and support you and your family and friends will have for Mason, he is sure to succeed and keep being the amazing little boy that he is!! HUGS momma!! 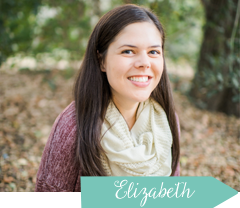 Perfectly and beautifully said, Elizabeth! Mason is a special boy and he is especially lucky to have a mama like you! Oh Elizabeth, my heart goes out to you! You have just the best attitude! Mason has been born into the perfect family. You may not know this, but before becoming a SAHM I taught kids with autism. While I don't have my own child with autism, I can understand your feelings. All I can offer is empathy & support! Mason will do great things; I can't wait to watch him grow, learn, & excel!!! This is so beautiful Liz you said it perfectly. My cousin just got her sons diagnosis a couple of weeks ago and she is struggling but I think the sooner the better the information is known the easier it will be to adapt to their learning and there's nothing that will slow those kiddies down. It's a bump in the road but it's not a sink hole. They're our babies and perfectly perfect! Just look at Masons little face! Ugh I could squeeze him! I'm sitting here with tears in my eyes. You are an amazing mommy and Mason is an amazing little boy! You are right...nothing has changed. He is still your perfect little boy. I'm so glad you will have access to tools to help him learn and grow. You can tell by your words and photos just how much he loves you..and how much you love him. And in the end, that's all that matters. Thanks for sharing your heart today my friend! You are such a good mama; you and Mason were made especially for each other and will be able to overcome all obstacles together. Loving our children as they are and not what we think they should be is our ultimate job but one I struggle with sometimes. Thanks for sharing a beautiful perspective. Also know many are in your corner and be encouraged, friend. oh the tears and sniffles. I even waited to read this since I knew I'd end up crying. Love this post. You are so right that he is no different than he was before but you've been given more tools now to understand and to help him grow in the best ways. You are such a good mama and Mason is a wonderful little boy - you are lucky to have each other, and Seth. You guys are a great team. I'm sitting here in the 90 degree heat and I have chills that just won't go away. Actual goose bumps all over and it's not because of the diagnosis - it's because of your words. Mason is an awesome little boy and to have you as his mom, his advocate, his family - well, that's just the best thing in the whole world. Beautiful letter Liz. You're right that Mason hasn't changed, but now you and Seth will both be able to help him grow and learn better than if you didn't know. You are such a great mom and if I could give you a big hug in person I would! Elizabeth, you have the most amazing outlook, and the correct one. I wish more parents had your outlook on receiving an autism diagnosis. When we first suspected my sister had autism in the mid-90s (when she was about Mason's age, maybe a little older), culture made it seem like something to deny rather than embrace. My mom embraced it, but my dad denied it for a long time - until we got an official diagnosis that she was on the spectrum in middle school. Yes, it took them THAT long to make it official even though she began services at age 3. Anyway, I can tell you from experience that Mason is absolutely the same person he always has been. He is the little boy you brought into the world and have known all this time. What you don't know is how much he's going to teach you. If you're anything like me, his differences are going to change the way you see the world and make you want to change it. I'm a better person for knowing my sister. She's a great secret keeper, gives the best hugs, and loves my daughter more than anything. At 22, she's holding down a part-time job and has even received a promotion, which is more than we dreamed for her while she was in school. It's true that her life doesn't look like we originally thought when my mom was pregnant, but I've come to celebrate it. People with special needs remind and teach us of so many things. Sending you all the hugs I can - Please feel free to reach out if you need it! Oh Liz, this is such a beautiful letter and such a beautiful way to express such passionate feelings. I am so incredibly happy that you guys finally have a diagnosis and can start making some real progress. As scary as it probably seems, I'm sure you also feel relief having an answer and a name for things. Mason is going to do amazing things are will become a beautiful, sensitive, loving and intelligent man because he has such incredible loving understanding parents. You guys are doing the right thing and giving him so much, just by being supportive and encouraging. You guys rock! Such a beautiful letter. Your outlook is going to make all the difference in the world. I'm sure it will be scary at times but you (and it seems your whole family) is ready to take the bull by the horns and really be amazing advocates for Mason. He has such an incredible support system and I'm sure is destined for great things in this world. Many hugs to you and your sweet family. Thank you so much for sharing your walk with autism! Such a beautiful letter and such a wonderful outlook. I'm sure it can be difficult to be positive at times, but the strength you exhibit is inspiring. Despite the challenges you may have ahead of your family, that little boy already so so loved and will conquer anything with you and Seth behind him! Liz, this letter is absolutely beautiful and perfect. You are such a strong, strong momma. And Mason is just the luckiest little boy to have amazing parents to put all the pieces of your puzzle together. It must be the biggest relief to finally have answers, and stepping stones to move forward. We're praying things go well with the ENT, and that even more doors are opened for you. And, you're right. Nothing has changed, except maybe your hearts have grown a little bit more. All the hugs to you, Seth, and of course that sweet little man, Mason. Beautiful sweet friend... Thanks for sharing your heart and your journey with us all. As I read this all I could think was Mason has some amazing parents- so excited to see him grow. We are currently going through some speech things with our middle child and I was recently thinking how no matter what the diagnosis is he is still my sweet boy- nothing changes that. Thanks for sharing your heart- enjoy your weekend as a family! We've talked about this and you know how amazing I think you and Mason are but I still felt like I needed to share something here too... you are a beautiful Mama to a boy with a beautiful smile and heart. Nothing changes that. No diagnosis. No label. God placed Mason in your hands because he knew that without a doubt, you would be the perfect mother to love, nurture, grow and support him. You have such a wonderful outlook... one that, if I'm being honest, wouldn't be so easy for me to have. But you are strong, you are loving and you can handle this. This is absolutely beautiful. Mason is a lucky little boy. As a professional I always love hearing a parent's perspective. Beautifully written my sweet friend. Mason has the perfect parents for him. You are undoubtedly a wonderful mother, the perfect mother for Mason. Trust your heart, have faith and love fiercely. I may not be close enough to hug you or enjoy a cup of coffee, yet I am always a text, phone call, Skype chat away. I love you more than words. And I can't wait for Mason to move into his dorm and I hope he gets as lucky as I was to meet such a kind, beautiful soul. Liz, this is beautiful. You and Seth are such amazing parents and Mason is just pure awesome!! You two are going to help him grow and thrive in amazing ways. God placed little Mason in your lives...handpicked you two to be his parents. So very beautiful. So many amazing adventures that you guys have to look forward to! God's blessings to your sweet family!